Last year News Corporation announced it had joined forces with AT&T to create an educational platform for tablets, which would be sold expressly for use in schools through its recently formed education business named Amplify. At the time, it gave the impression it would only ever be a piece of software compatible with existing tablets and operating systems. This has turned out not to be the case, as at a special SXSWedu event News Corp and Amplify have announced the Amplify Tablet, a custom slate which comes pre-installed with Amplify’s software along with third-party educational tools, plus ways for the teacher to interact with students. Amplify hopes that by making the tablet more interactive, it’ll become a key part of everyday lessons instead of the underused tool it considers it to be today. All the Amplify curriculum is there, including educational games, plus teachers and schools can upload their own content onto the Amplify Tablet. The specification of the tablet is a mystery, but we do know it has a 10-inch screen, runs Google Android as its operating system and has been manufactured by Asus. The OS has been heavily modified for its use in the classroom, with remote access to disable certain applications, the option to send mid-lesson quizzes, and even an, “Eyes on teacher” warning on the screen should the student’s attention wander. There are several different tablets available, but the basic model with Wi-Fi, along with the curriculum program, training and a support package costs $299 with a mandatory two-year subscription fee of $99 per year. The idea is for students to use the tablet at home and during travel time, and as such a model with 4G connectivity and a data plan can be purchased for $349, with a $179 per year subscription for a minimum of two years. The basic cost of the Amplify Tablet undercuts the iPad, which Apple has been pushing as a great educational product ever since it was first introduced. Apple claims to have sold 8 million iPad tablets to schools around the world, and offers more than 20,000 educational apps in the App Store, plus an extensive library of text books through iBooks. 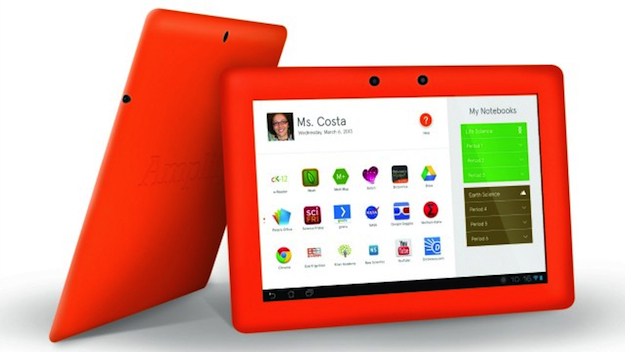 Amplify is aiming its tablet at K-12 students, which is the same area Apple says the iPad has seen considerable adoption. Apple’s Tim Cook said this was, “One of the things that is so rewarding,” about the iPad, so we can expect the company to watch Amplify’s progress closely; however, Apple’s strong international presence in the educational system will ensure it’s not too worried about Amplify’s arrival just yet.